YCT is the Harlow-based counselling and therapeutic support charity, specialising in helping children and young people aged 5 – 25 years, their families and the professionals who work with them. I had the pleasure of supporting their work whilst I was a Councillor and Mental Health Champion and have pledged to continue to remain connected and help promote their valuable work whenever I can. YCT started out in 1988 serving the immediate local community around Harlow, but they’ve grown considerably and now work in community venues, schools, academies, colleges, alternative education provisions and specialist schools across Essex, Hertfordshire and Greater London. YCT held its first annual lecture six years ago as part of their 25th Anniversary celebrations. Last year I had the privilege of seeing Sarah Simpkin from The Children’s Society, deliver a powerful lecture about Child Sexual Exploitation, the significance of which, to all of our lives, is still greatly underestimated. 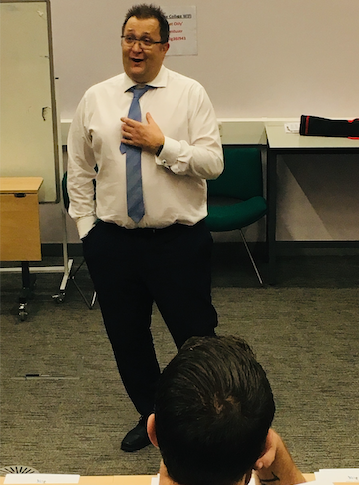 Last night, Vic Goddard, Headteacher at Passmores Academy, delivered the sixth Lecture: “The importance of creating inclusive environments and developing empathy in young people”. The evening began with an introduction and welcome from Neil Frost, Chair of the YCT Board, and the presentation of the Lady Diana Kemp-Welch Awards by Sir John Kemp-Welch. Each year these awards are given to young people who have benefited from YCT’s services and gone on to show how changes in thoughts and behaviour can, not only have a lasting impact on the lives of individual, but on their families, schools and the community around them. This provided a fitting backdrop for Vic Goddard lecture. Having got rid of the “Educating Essex” elephant in the room, Vic got into his chatty, conversational-style of delivery that some will be familiar with. Vic gave a sixty-minute snapshot of why and how he and his colleagues do what they do at Passmores and the difference it makes not only to young people, but to our community, and how the benefits of that difference is not only felt once, but again and again throughout people’s lives. Vic explain how creating an inclusive environment is a ‘values driven process’ that everyone is expected and encouraged to contract into: that’s all staff (not just teaching staff), governors, students, parents, guardians, families and the communities that engage with the schools under the Passmores umbrella. Vic explained that responsibility is owned by everybody, as are the results of delivering “Unconditional Positive Regard”. Vic said that the young people who first present themselves to valuable organisations like YCT are often a clear indicator of rejection, not necessarily by design or deliberate intent, sometimes not knowingly, sometimes through ignorant tough love where “your dreams don’t matter son”. Vic spoke about the need to root our support for our young people in the real world, where the reality of “online socialising” cannot be ignored without ignoring something that is a large part of their lives. The Passmores approach accepts that a small proportion of students who come through their doors bring with them a background of ‘Adverse Childhood Experiences’ that, if ignored, will hamper their education, impact on their fellow pupils, risk leaving an indelible imprint upon their health and wellbeing, and potentially become self-perpetuating through their future relationships. Addressing, resolving, and preventing Adverse Childhood Experiences is a win, win, win – short, medium and long-term – for everybody. Vic explained that his approach doesn’t make him popular with some politicians. That doesn’t seem to trouble him much. Vic and his colleagues recognised that they are paid to serve the community and they are clearly determined to do that. They are paid to see children as opportunities not obstacles. The lessons their young people receive are tough, but “Authentic”, lessons delivered in a supportive way, and Vic has the evidence that, irrespective of league tables, individual or collective academic results, “the kids leave Passmores ready to be a success”. That’s just a flavour of the intelligent and informative lecture that Vic delivered and it’s indicative of the quality of the work that YCT deliver too, day to day, but also more widely through community engagement and interaction. The evening was brought to a close by Nick Phipps, YCT CEO, who launched the publication of YCT’s 2017-18 Annual Review. 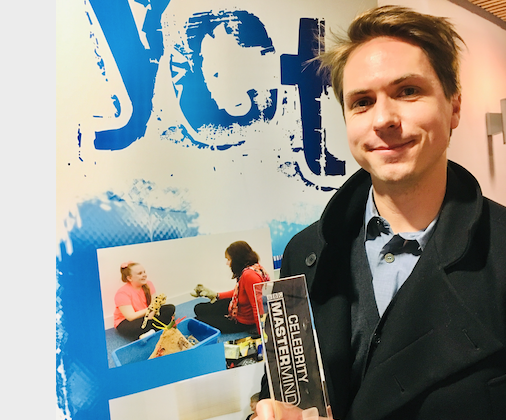 Nick said that despite the challenges of securing funding and resources that all charities and the voluntary sector were experiencing, YCT continues to record success after success, with support being given to over 1,000 children and young people over the last year, and delivering nearly 8,000 hours of therapy. Nick introduced TV actor Joe Thomas, one of YCT’s Patrons, who recently won BBC TV’s Celebrity Mastermind. Along with the trophy that Joe cherished, YCT received a cheque for £3,000 from this win which Nick said would go some way to helping the organisation not have to dip too far into their reserves. Joe Thomas admitted, without a hint of jealousy, that Vic Goddard had probably had more TV exposure than he had in recent weeks!